A new contest to encourage new research from within the UK’s optometry universities – backed by contact lens giant CooperVision – saw two students from Bradford carry oﬀ the prize. Despite it being the inaugural contest, in all the competition attracted representations from almost all the universities in the UK which run optometry degrees. Each entry was required to present their ﬁndings at CooperVision’s south coast headquarters at a special two-day event which took in learning, networking and social activities. The contact lens giant approached 10 universities this summer, and asked their students to submit ﬁndings on contact lens topics to be in with the chance of winning £2,000 each. An optical lecturer from each university marked the submissions and selected one winner from each university to receive £2,000 each. The overall winners received a full delegate package for next year’s BCLA conference along with the prize money. Seven universities took part in the ﬁnals, some having two participants, some having one. 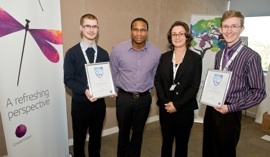 It was the duo of Pat Friis (pictured left) and Barney Norris (right) from Bradford University who carried oﬀ the ﬁrst prize.